"What is money?" Today's trailer comes from Drafthouse Films, the distribution arm of Tim League's Alamo Drafthouse, with a film called Pieta (referring to Michelangelo's statue). Pietà is the acclaimed new film from the celebrated and controversial Korean director Kim Ki-Duk (Bad Guy; Spring, Summer, Fall, Winter… And Spring; 3-Iron). This mysterious, dark crime drama stars Lee Jung-jin as a relentless loan shark whose life is changed when a woman shows up claiming to be his long-lost mother, played by Cho Min-soo. It's definitely sold as a "wickedly twisted tale", the kind of film some moviegoers love to discover. In this intense and haunting story, a loan shark living an isolated and lonely existence uses brutality to threaten and collect paybacks from desperate borrowers for his moneylender boss. One day, a mysterious woman appears in front of him claiming to be his long-lost mother. After coldly rejecting her at first, he gradually accepts her in his life and decides to quit his cruel job and seek a decent, redemptive life. However, he soon discovers a dark secret stemming from his past and realizes it may be too late to escape the horrific consequences already set in motion from his previous life. Winner of the Golden Lion at Venice in 2012, Pietà will be released by Drafthouse Films in limited theaters on May 17th, iTunes on April 12th. 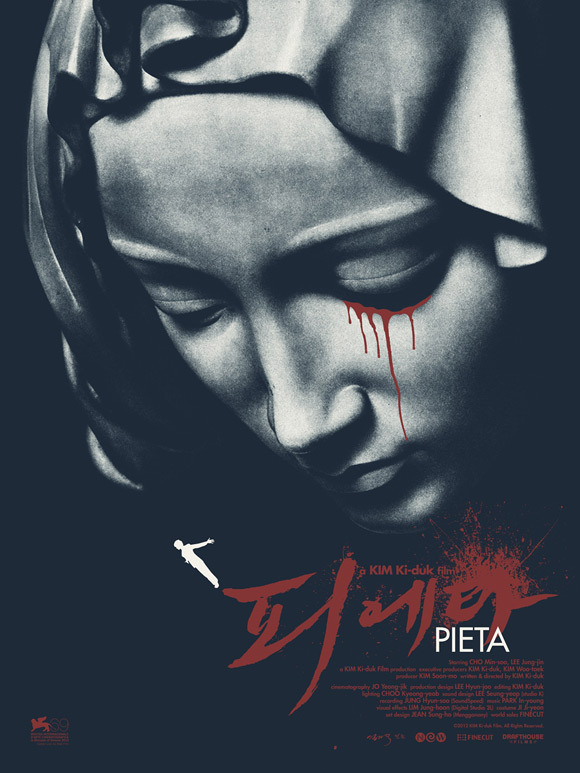 Above is the official poster for Kim Ki-Duk's Pieta, designed by Jay Shaw, and released by Drafthouse's poster art division Mondo as part of the release of this film (extending beyond the trailer). Fantastic design. Love that poster. Love this movie. I was glued to the screen. A little twisted, but oh so good. I've had a copy of this film for about 5 months now, it's good to see it's finally getting a release. I love the film and the grittiness of it. It definitely has a killer ending! Korean drama is what ruined Walking Dead this season.